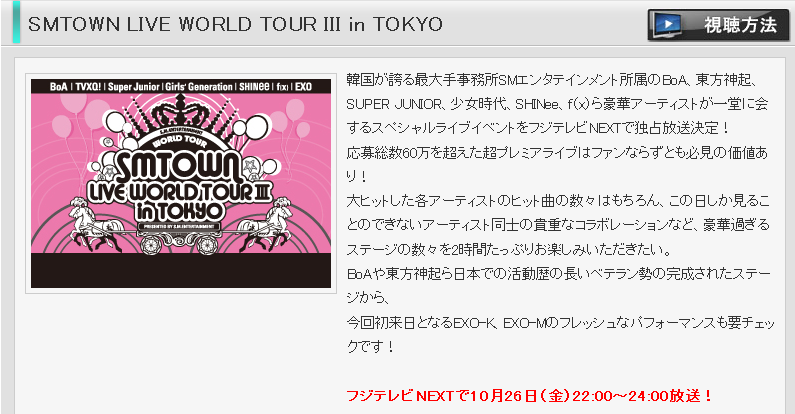 SMTOWN LIVE WORLD TOUR III in TOKYO will be broadcasted via Fuji TV Next on October 26th at 22:00~24:00 JST. Ever wondered what it takes to be BoA or a member of Girls’ Generation? For ‘1st Look‘ magazine, SM Entertainment labelmates got together for a special pictorial in time for the release of their new film, ‘I AM‘. Which artists in SM Town ever regretted being a member of their agency? SM Entertainment‘s new documentary film “I AM,” featuring the lives of artists like Kangta, BoA, DBSK,Super Junior, Girls Generation, SHINee, and f(x), cancelled its press premiere scheduled on April 30 without further notice. “I AM” was supposed to have its first premiere event for media and sponsoring companies on April 30 at 4pm.